Available only at TheSignChef.com, the Art Department is at your service to create original layouts for your new signage at no charge. This service has been specifically designed to protect and preserve the integrity of your brand by providing you with the opportunity to approve every aspect of your final design prior to production. Should you need any changes made to your layout, TheSignChef.com will be happy to provide those changes for your approval before your order is released to production. 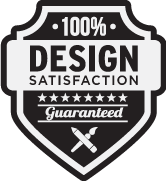 Once you have approved your layout, our guarantee has been fulfilled. This straightforward process ensures your complete satisfaction, start to finish. There is absolutely no charge for changes made to your layout, no matter how many changes you request. 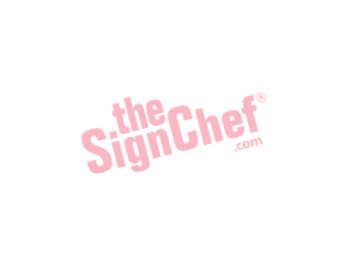 In the unlikely event TheSignChef.com is unable to meet your layout preferences for any reason, please email Customer Service at service@thesignchef.comfor a full refund. 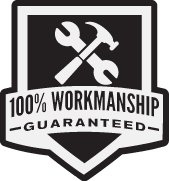 TheSignChef.com stands behind its work with a 100% Workmanship Guarantee. If you ever receive a product that is defective in workmanship or different in specifications from what you ordered, TheSignChef.com will replace that product free of charge and pay forshipping. We stand behind our work with a 100% Order Accuracy Guarantee. If you ever receive anything from our company that is different in specifications from what you ordered, we will replace that product free of charge—and even pay the shipping!! The final sizes and measurements of your order are subject to tolerances, plus or minus, of up to ½” (one-half inch). If your order requires an exact size, you must inform Customer Service. Signage produced within this ½” range serves the interests of the customer by optimizing the yield of raw materials. By optimizing the yield of materials, prices are reduced because waste is dramatically lower. PS - If you love our services, please tell your friends about us! We at TheSignChef.com want you to be happy with your purchase. 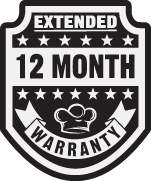 That’s why we have a 12-month warranty that begins when your purchase is shipped. This is our way to ensure you never have to deal with defective products or poor craftsmanship. As part of the warranty, TheSignChef.com may satisfy warranty conditions by determining the cause of malfunction and replacing products without refunding or crediting customer accounts. All products that are replaced by TheSignChef.com are also under our 12-month warranty. TheSignChef.com may also make discretionary decisions for damages that are beyond its control. These damages may include improper installation, environmental damage, acts of God, or other damages that occur after the receipt of the product. At TheSignChef.com we also apply durability ratings to some products. These ratings are based on 30 years of testing and customer approval; however, they are not warranties of any kind. Durability ratings are not connected in any way to the 12-month warranty above. As a customer, by reading this, understand and fully agree to the warranty conditions provided here as well as all other terms and conditions. All Genimi products purchased through TheSignChef have a lifetime warranty. At TheSignChef, we want you to know that your transactions with us are secure. Currently, there are many security measures in place to prevent the misuse, alteration, or loss of any information. Some of our measures include 256-bit encryption, password protection, and we even use offline databases to keep our information secure. 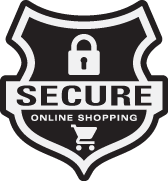 In addition to our in-house security efforts, there are additional protections that make online shopping secure. Please visit our security page or contact us at service@thesignchef.com to find out more about why it’s always safe to shop with us. Ask Customer Service about this optional upgrade for vinyl letters, decals and graphics. If you’ve never appliedvinyl letters or logosbefore, the process can seem intimidating at first. You don’t want to“mess up”and get the letters or logos crooked. Or even worse, botch the job so badly you have to buy another set and start all over again. Fortunately, the vinyl letters and logos you order from The SignChef.com are “goof-proof.”* With our Vinyl Magic Application Kit, you’ll be able to apply yourvinyl letters and logoslike a professional --the first time, every time. 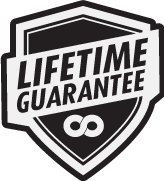 Our Goof-Proof Replacement Guarantee is an optional upgrade (an additional 25% of your total cost) with any order. If you do happen to mess up during application, we will send you replacement letters and logos. We’ll even pay for shipping.